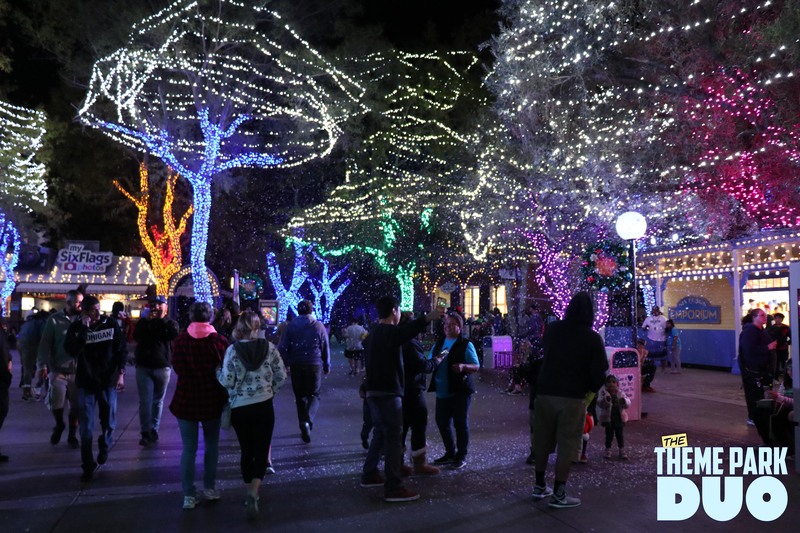 When you think of Six Flags Magic Mountain I bet you think of roller coasters and food and fun and… a winter wonderland? 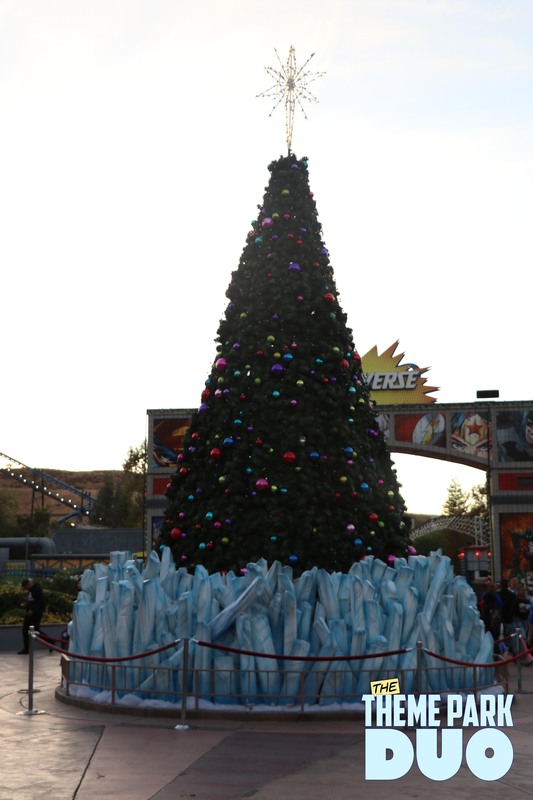 Well if you head over to Six Flags Magic Mountain this holiday season that is exactly what you will find. And so much more! 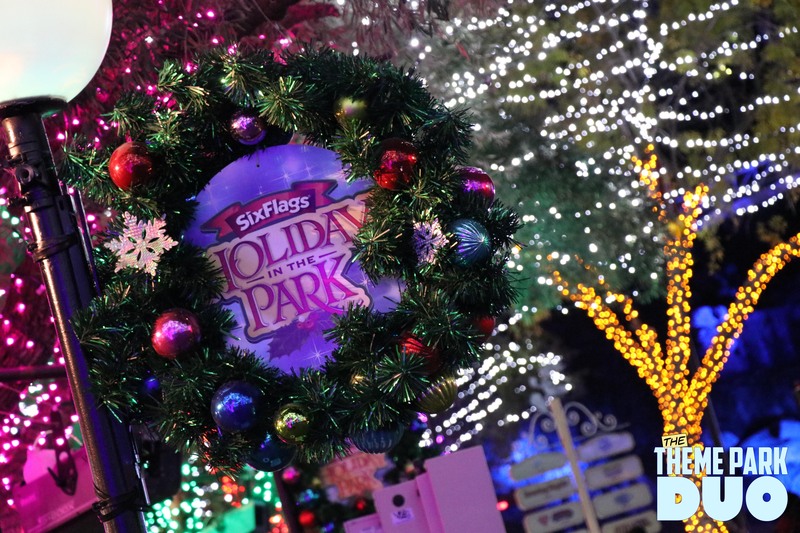 Six Flags Magic Mountain has been completely transformed for their winter event: Holiday in the Park! Gabe and I had the pleasure of checking this even out this year and we had a blast! 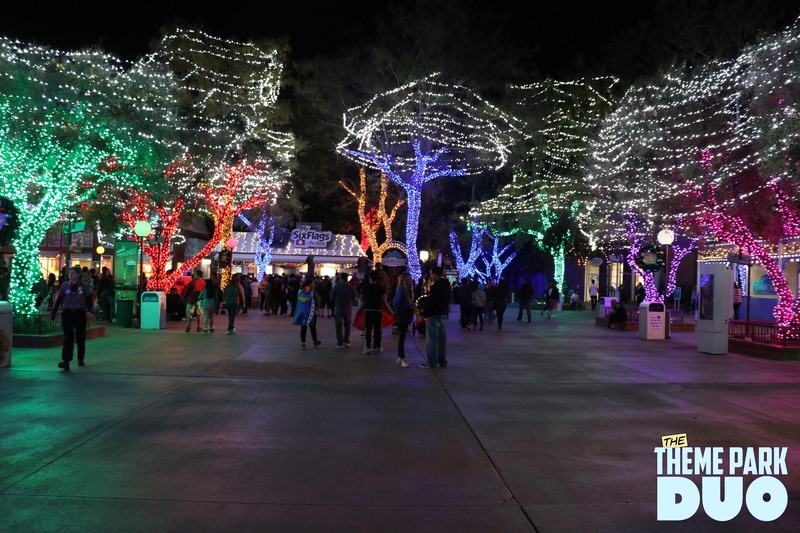 The entrance to the park has been transformed into Holiday Square. 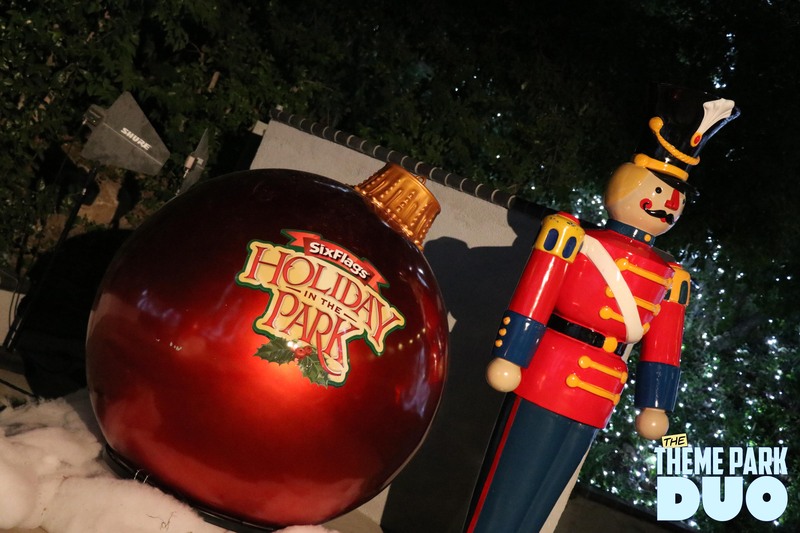 Everywhere you look you will see holiday decorations. 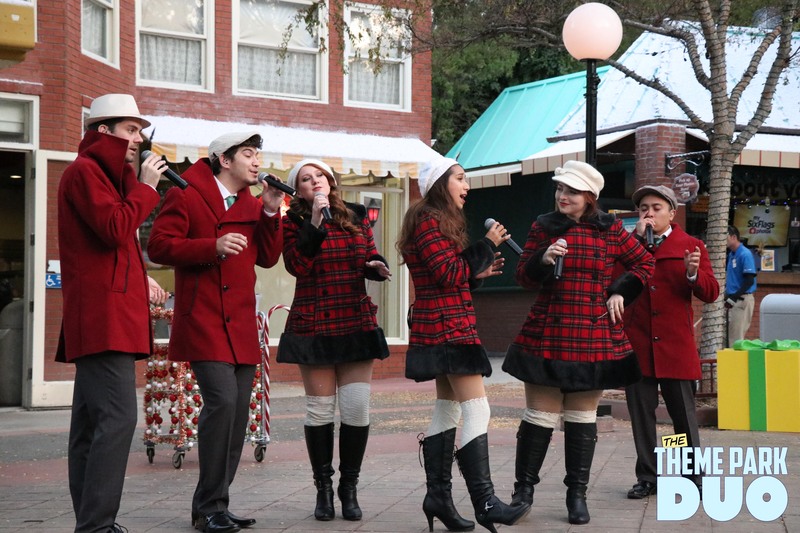 You will even find snow on every roof and carolers singing merry tunes. And if you stay into night time the lights look absolutely spectacular! 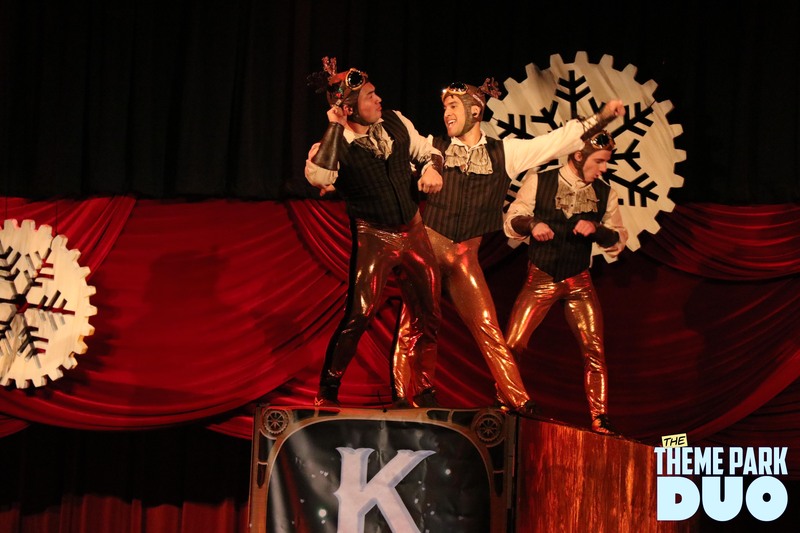 And don’t forget to hang around to catch a glimpse of nutcrackers marching by or wait around to watch the snow fall!! Gabe and I made sure to catch the snow falling (which isn’t difficult, it falls every 20 minutes!) and it really put us in the holiday spirit. 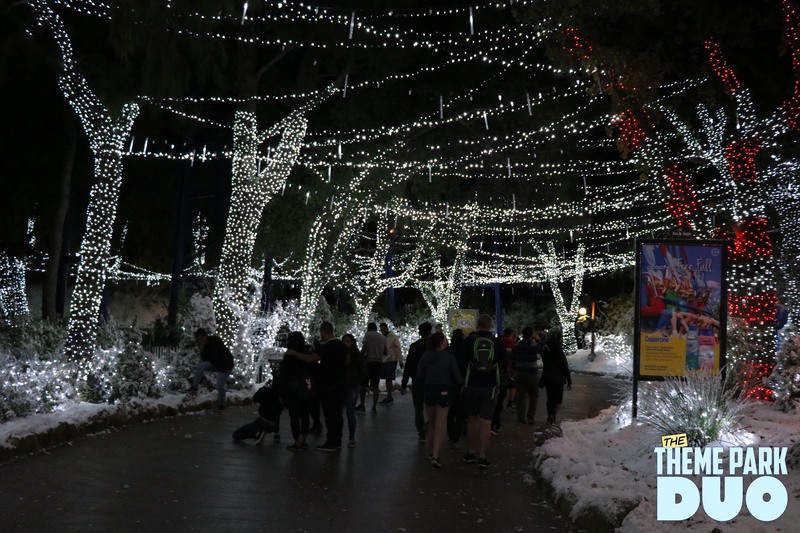 As you make your way around the park, be sure to stop by the Full throttle stage to catch Snowy Nights. 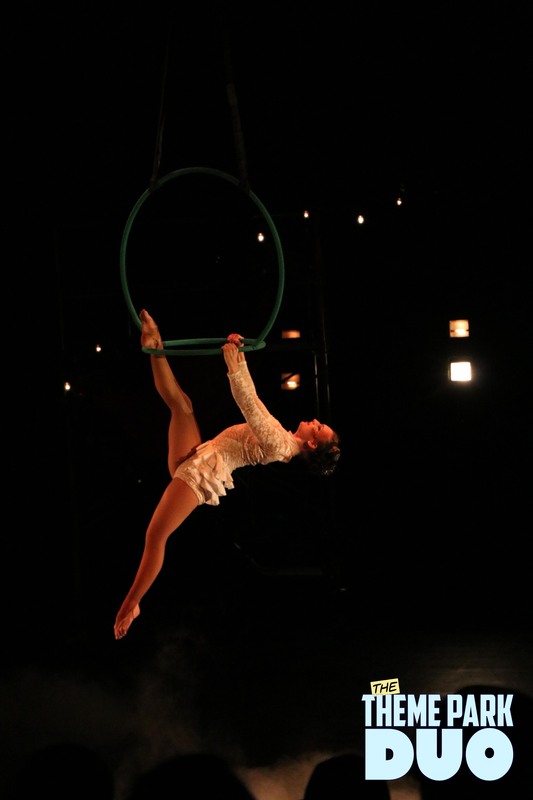 Live music, Dancers and DJ’s are there to perform nightly, and they really bring the whole area to life. Gabe and I were unfortunately not able to catch a performance this year, but if it is anything like what we have seen in the past, you’ll definitely want to stop by! 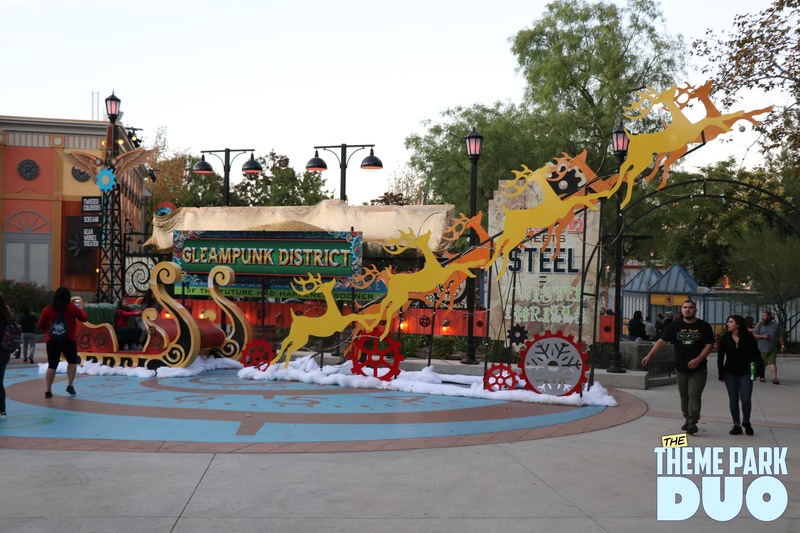 As you continue to make your way around the park you will come to our favorite Steam Punk inspired area: The Gleampunk District. 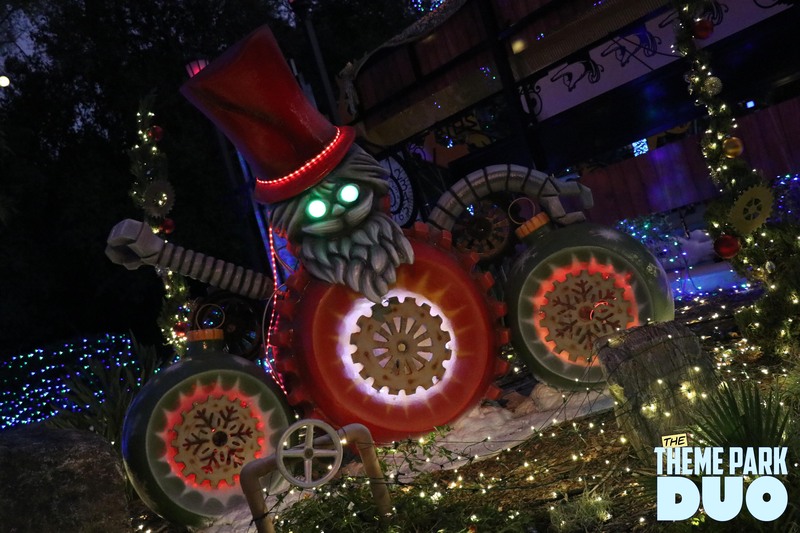 From the steampunk holiday decorations to the walk around characters, this area had a very distinct charm. And we absolutely loved it!!! 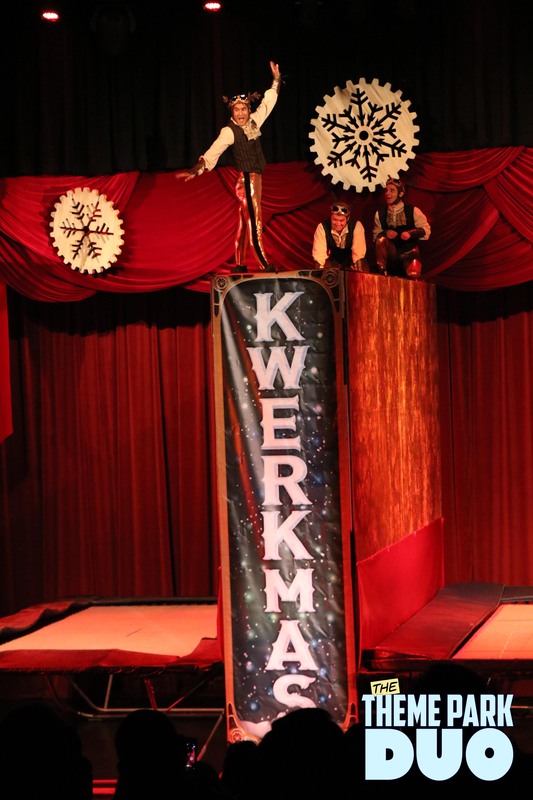 This was also where we went inside the theatre to catch the Kwerkmas show! We had a lot of fun watching the show, even more fun than we had watching the amazing projections that they have on the outside of the theatre! 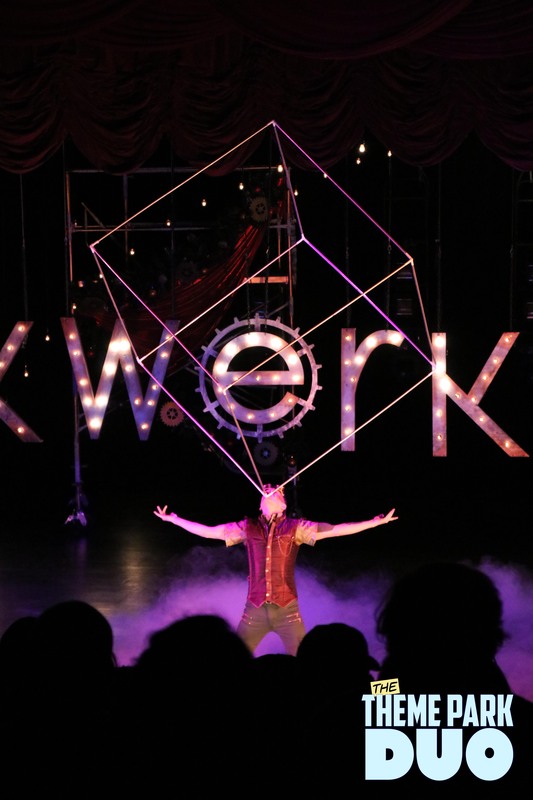 Kwerkmas was a fun Holiday inspired acrobatic variety show. We definitely recommend that you go see it! Right around the corner, in the DC Universe area, you will find Rockin’ Universe! This was one other area where Gabe and I did not spend a lot of time. 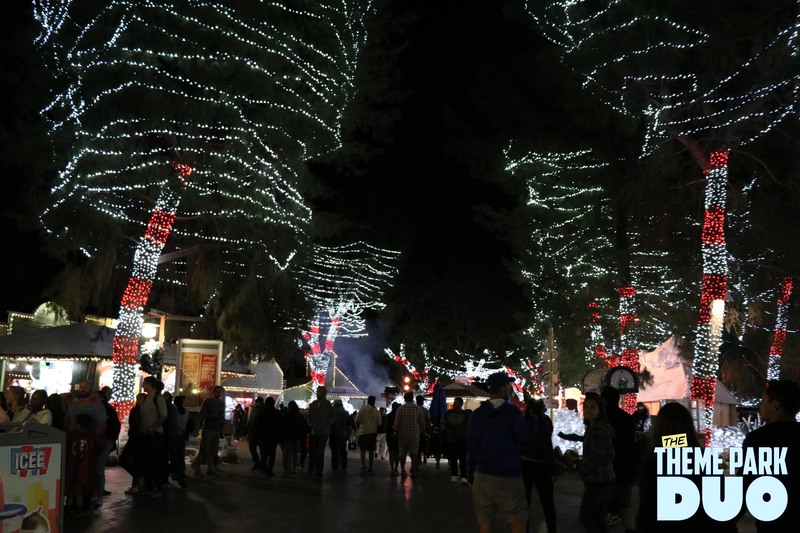 We were lucky enough to catch the tree lighting at the beginning of the night, and then there is a light show in the area every 15 minutes! 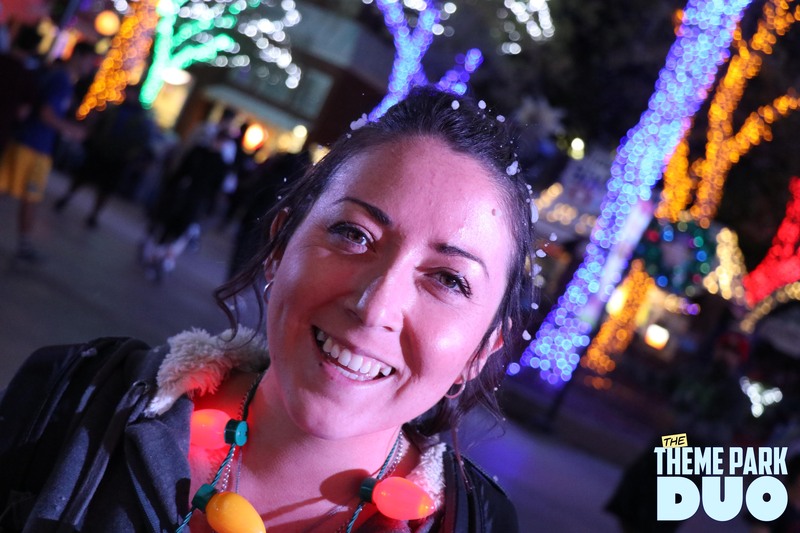 And based on the amount of lights that we saw, it is going to be quite the light show! 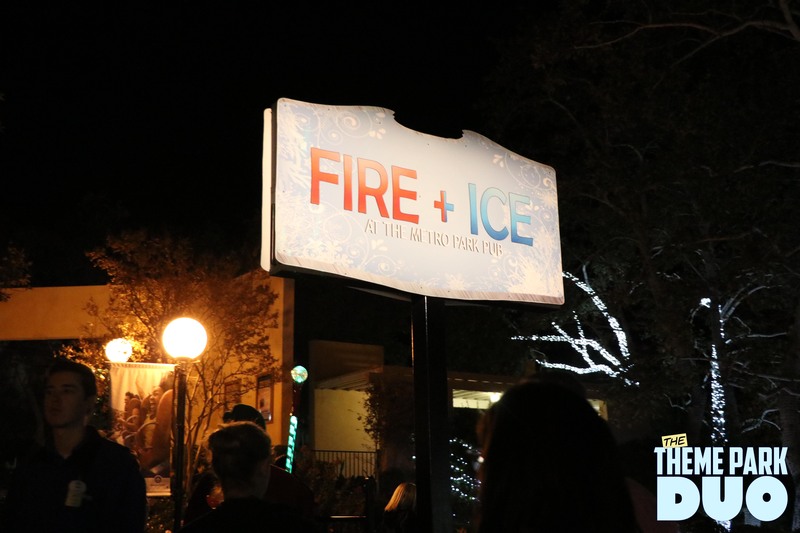 Walk a little further and you will hit the Fire and Ice Lounge. 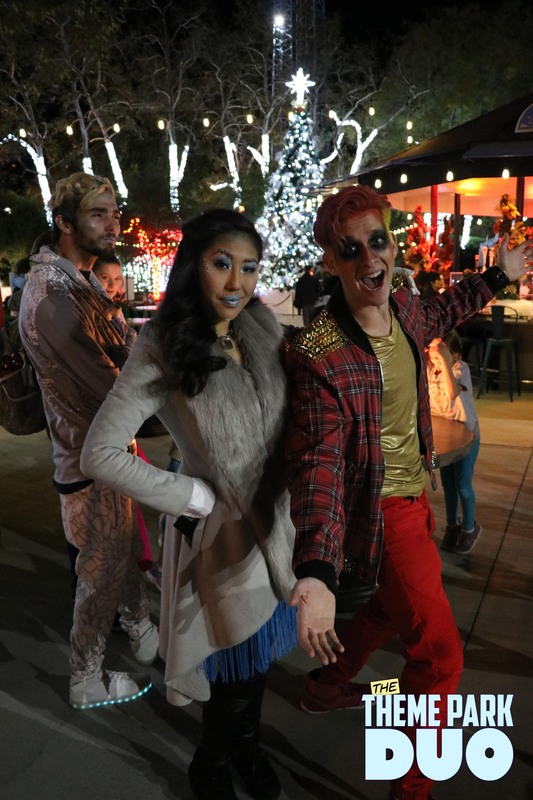 They have a few walk around characters, among them being Fire, and Ice! They are very fun to chat with. They also have a few fire pits where you can relax and have a drink. 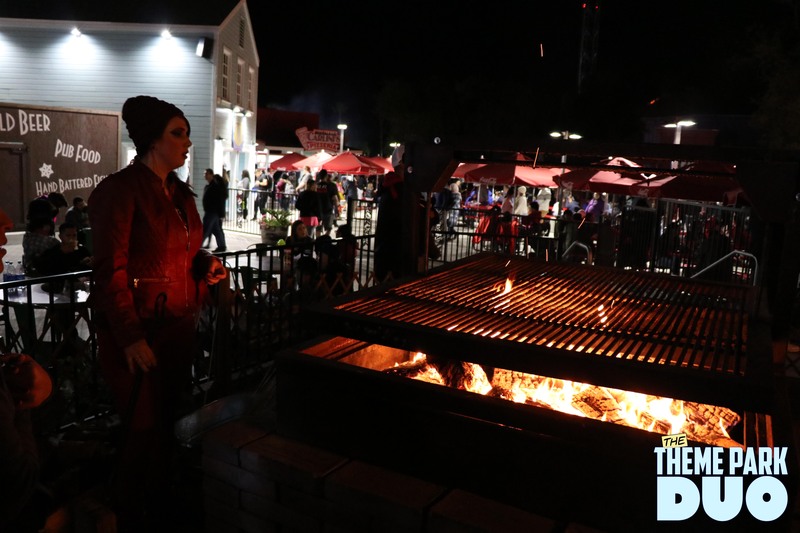 The highlight of the area for us though would have to be the fire pit where you can actually roast marshmallows and make SMORES! We thought this was such a charming and fun idea! And such a unique thing to see at a theme park! 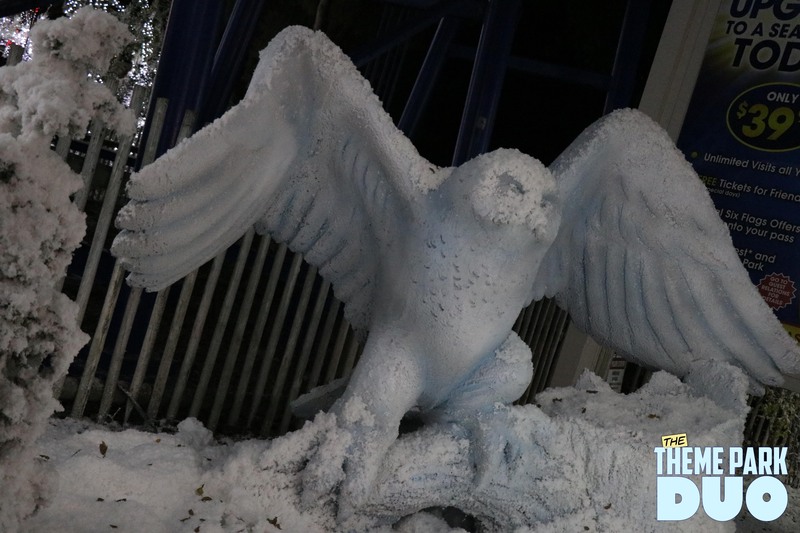 Our next stop, after a small trek up the hill, was Winter Wonderland! And it was just that, a real Winter Wonderland! 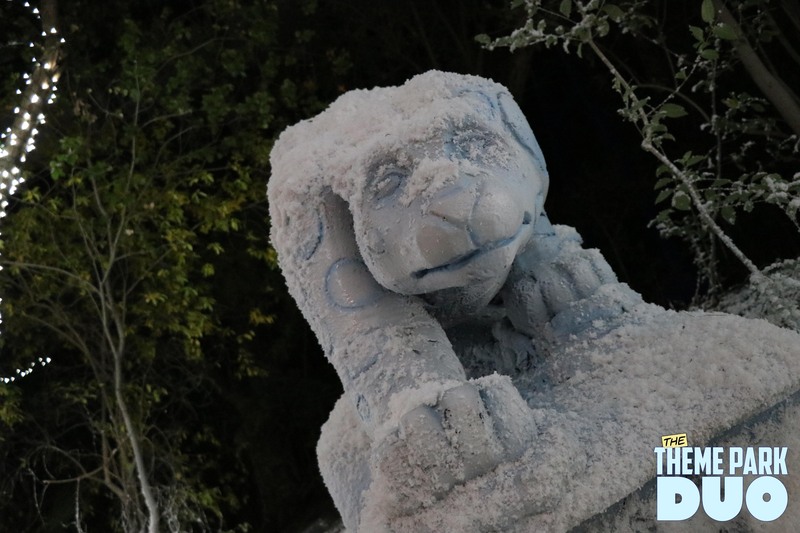 Located near Katy’s Kettle, this area was hands down our favorite area in the park. This is where you can meet Santa in his house, or you can do crafts with Mrs. Clause outside! There is also another fire pit for making s’mores!! Just past Santa’s house is the walkway that truly gives this area its name. 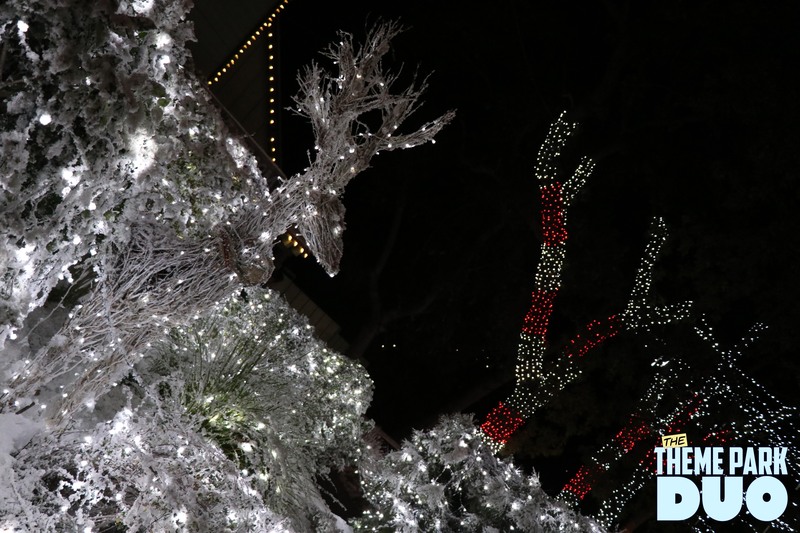 Twinkling lights overhead and snow on the ground truly make this winter wonderland come to life. 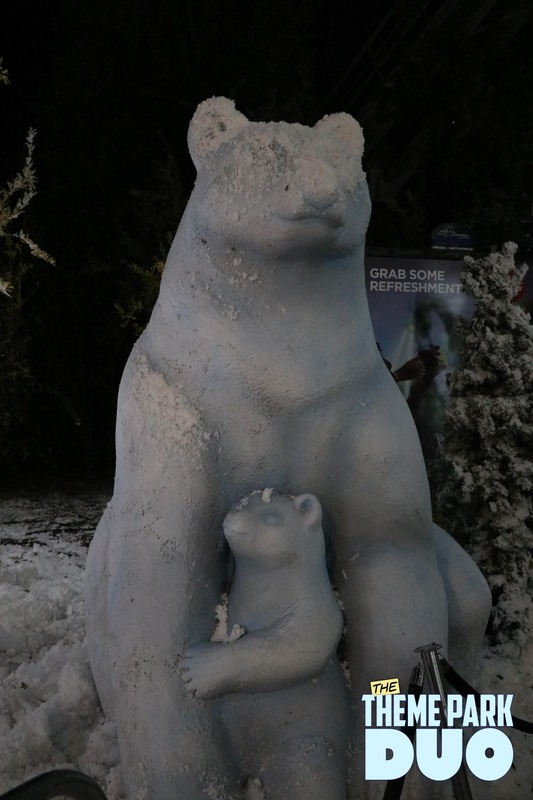 There are even some animal snow sculptures! This area took our breath away and we never wanted to leave! Our last stop of the night was a ride on Santa’s sleigh. We headed over to The New Revolution to try out their Holiday VR experience. Unfortunately we cannot review this experience because we didn’t actually get to see it. We rode the New Revolution two times and unfortunately for us, the VR headset did not work either time. While we would have loved to experience and review the Holiday VR, there is much to be said for The New Revolution on its own. 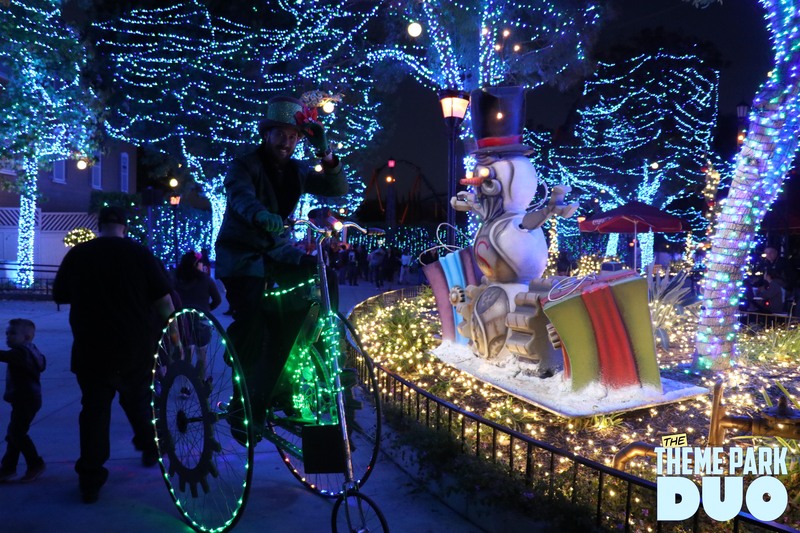 It is a very fun coaster that we had the pleasure of riding twice that night. The only thing we can say about the VR is that it is a little bit of a gamble if you choose to try it; but if it doesn’t work, the ride workers are very accommodating and will let you ride again right away. 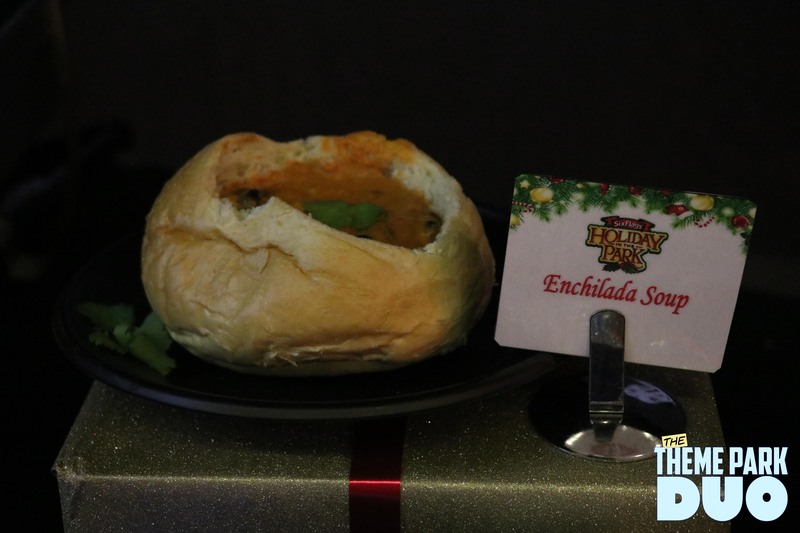 Aside from all the things at the park to experience, there are so many things at the park to EAT! 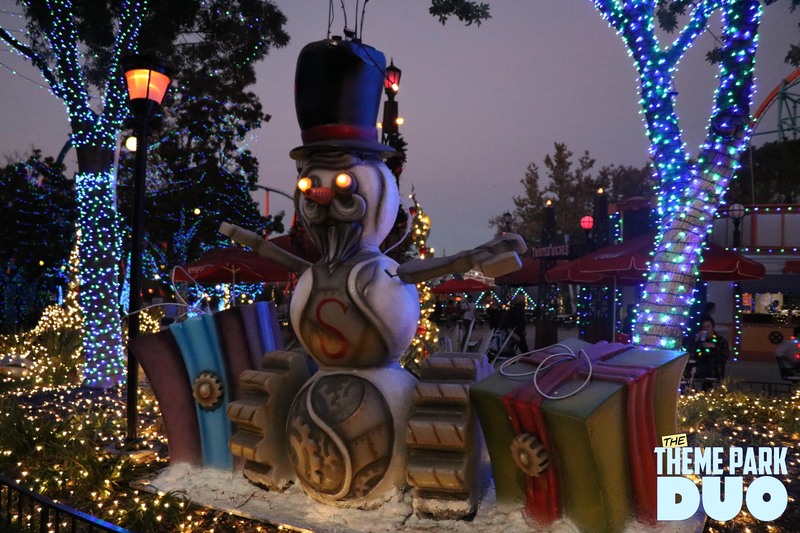 There are so many holiday treats scattered all over the park. 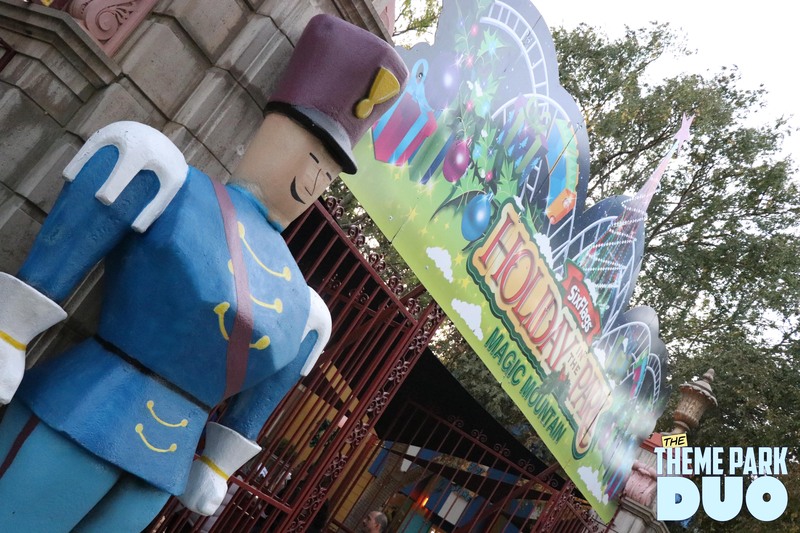 We loved this so much because you get to traverse the park and find goodies everywhere you go! Just make sure not to eat too much before riding any of the amazing coasters. From Tamales to Latkes, all of your Holiday favorites can be found. Also you have to grab a Hot chocolate in a reusable souvenir Holiday travel mug! 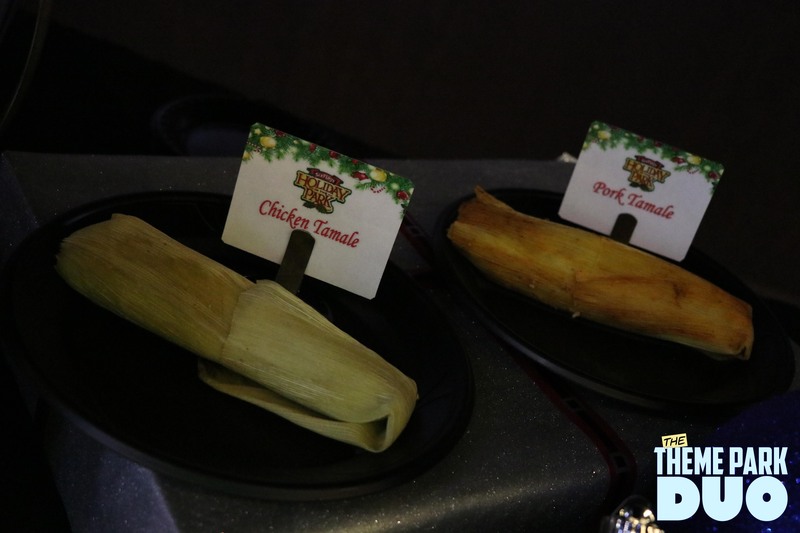 We were particularly fond of the Elote Corn, Latkes and the Lobster Mac and Cheese. 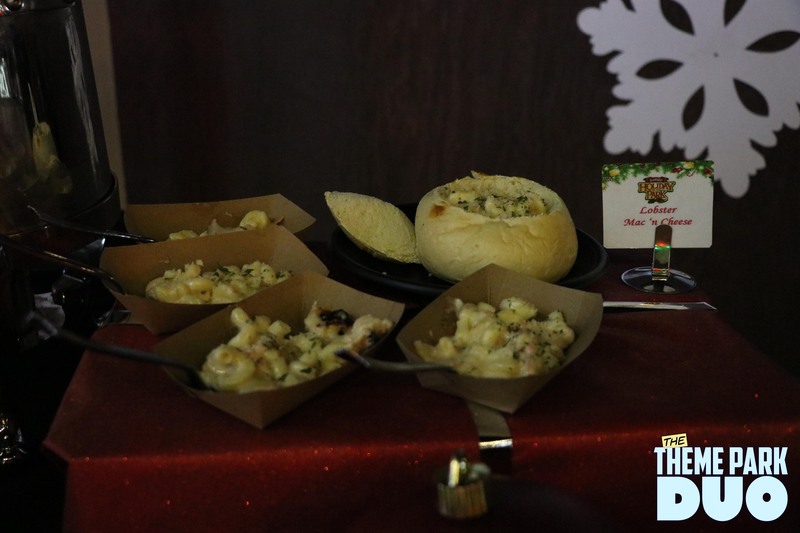 I believe Gabe ate around 3 servings of Mac and Cheese which would equate to around a family of Lobsters…he said it was worth it. 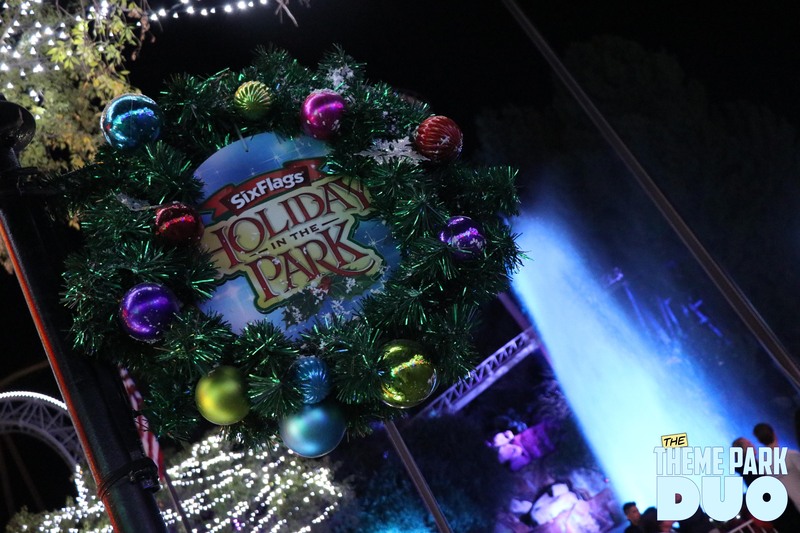 Overall, Holiday in the Park at Six Flags Magic Mountain was an event that completely took us by surprise!!!! We had such a great time and were immediately put in the holiday spirit. It is truly a fun and energetic event with something for every member of the family.